Tindaloo in CyberSpace: En klem fra hjertet! Helt sånn i siste minutt fikk jeg levert et kort inn til Trykkpressa i kveld *puh* Jeg ble helt forelska i det orginale kortet i en av utfordringene (bilde lengre ned) det var så nydelig ♥ lagd av Elin ~ Papirmølla. I focused on the lovely heartshape and text inside to create my card, and having only minutes to spare, I kind of rushed it so it became a simple design. But I like it! Very elegant look I think, and the sentiment is really standing out. Stamps/Images: Norsk Stempelblad ~ Ett Trykk 'CS tekst07'. Papers: Bazzill cardstock. Plain white cardstock. Studio Light paper pad 'My botanical garden'. 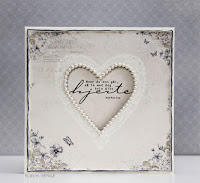 Embellishments/Tools: Simply Cards and Papercraft magazine #131. 'Swirly Heart embossing folder & stamp set. Crafts Too Presscut 'Circle Nest Dies PCD46'. EK Success® Whale Of A Punch 'Large Circle 1.75'. Washitape 'Gold' unknown. Techniques: I always use my Scor-Pal to score n fold my cards. I prefer Canson Montvale aquarelle paper (200 g/m coldpressed). My distress tools from Ranger Ink is always in use! ~ Tim Holtz® Mini Ink Round Blending Tool & the Inkssentials Ink Blending Tool and Foams. Just HAVE to get those edges inked! I used Tim Holtz Distress Ink pads 'Tea Dye' and 'Vintage Photo' to distress image and papers. Prima chalk ink 'white'. this is so elegant, amazing work. Så bra at du hev deg med i siste liten! Lekkert kort :) Lapp i hatten! Very pretty. Thank you so much for sharing your lovely creation with us at Dream Valley Challenges. Beautifully done! Marvelous scrollwork. It's so much fun to see you entering our "Anything Goes" challenge at Crafts Galore Encore this month. Hope to see you playing again. Good luck in the draw. Veldig flott! Så enkelt og flott! Lekkert og stilrent!! Tusen takk for at du er med på utfordringen vår hos Scrappegarasjen! Very elegant card, so pretty!